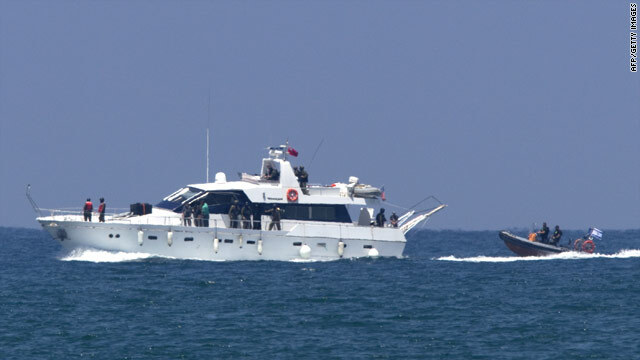 An Israeli navy rubber boat escorts a yacht from the Gaza-bound aid flotilla to an Israeli port. The boarding of the ships took place more than 70 nautical miles outside Israeli territorial waters, according to the Turkish-based Humanitarian Relief Foundation or IHH -- one of the organizers of the flotilla. Israeli soldiers stormed a flotilla of six ships carrying aid for the Palestinian territory of Gaza in a pre-dawn raid on Monday, killing at least 10 people, the country's military said. Five soldiers were among the wounded, with two suffering serious injuries. The Israeli military said the soldiers were attacked with knives and gunfire and that their lives were in danger. "We did not attack any boat, we merely fulfilled the Israeli government's decision to prevent anyone from going into the Gaza strip without coordinating with Israel," a military statement said. IDF spokeswoman Lt. Col. Avital Leibowitz said light weapons and handguns were confiscated from the flotilla. "We basically encountered a lynch," she said. "We had to control this violence." Israeli government spokesman Mark Regev accused the leaders of the flotilla of looking for a fight. "They wanted to make a political statement. They wanted violence," according to Regev, who said Israel wanted a peaceful interception of the ships trying to break Israel's blockade of Gaza. "They are directly responsible for the violence and the deaths that occurred." The Free Gaza Movement, one of the groups sponsoring the flotilla, said in a Twitter post that Israeli commandos dropped from a helicopter onto the deck of one of the ships and "immediately opened fire on unarmed civilians." Video aired on CNN sister network CNN Turk showing soldiers rappelling onto the deck of a ship from a helicopter above. The ships of the flotilla were being taken to the Israeli port of Ashdod, the military said. Israeli Prime Minister Benjamin Netanyahu, traveling in Canada, was receiving frequent updates. Police stepped up security across Israel. Palestinian President Mahmoud Abbas called for three days of mourning in the Palestinian territories. "We condemn in the strongest possible terms this Israeli attack on civilians who came from all over the world peacefully with wheelchairs and food supplies and medical supplies," said Saeb Erekat, the chief Palestinian negotiator. Said Palestinian Prime Minister Salam Fayyad: "Nothing can excuse this attack by armed forces on a humanitarian convoy. The Palestinian government strongly condemns this crime, which portrays, once again, Israeli disrespect for the lives of innocent civilians, and its disrespect for international law." Sami Abu Zuhri, a spokesman for Hamas, said: "The Israeli occupation tries to deny this massacre by saying that the activists on the boat are from Hamas and Muslim brotherhood and this is a lying campaign, because the activists are international activists and between them are parliament members of western countries and know international peace activists." The United Nations said it was shocked at the loss of lives and urged that Israel take no further steps that could endanger civilian lives. "We wish to make clear that such tragedies are entirely avoidable if Israel heeds the repeated calls of the international community to end its counterproductive and unacceptable blockade of Gaza," said a joint statement from Robert Serry, UN Special Coordinator for the Middle East Peace Process and Filippo Grandi, Commissioner-General of the UN Relief and Works Agency. The British Foreign Office said it was seeking "urgent clarification" into the incident. The Swedish foreign ministry summoned Israel's ambassador to determine what happened to Swedes aboard the flotilla. According to CNN affiliate TV4, 11 Swedes are among the activists traveling aboard the ships. "What has happened is completely unacceptable and if it has happened on international waters it would make it even more serious and there must be a strong European reaction," said Foreign Ministry Cabinet Secretary Frank Belfrage. Greece also summoned the Israeli ambassador in Athens to demand a report on the safety of Greek passengers aboard the flotilla. After the meeting, the Greek foreign ministry said that the visit of the Israeli Joint Chiefs -- scheduled for Tuesday -- is being postponed, and that the Greek-Israeli military exercise that was in progress has been discontinued. A Greek foreign affairs ministry official could not say how many Greeks were aboard the six ships. The Turkish foreign ministry summoned the Israeli ambassador for an explanation. "This grave incident which took place in high seas in gross violation of international law might cause irreversible consequences in our relations," the ministry said in a statement. Among the activists aboard the flotilla was Fatima Mohammadi from Chicago, according to the Free Gaza Movement - Chicago. Kevin Clark, a member of the organization, said that neither he nor Mohammadi's mother, who lives in Boise, Idaho, had heard from her. "None of us envisioned they would do this," said Clark. "Speaking for myself, this will not deter us." Protests continued Monday outside the Israeli embassy in Istanbul. The protests, which began on Sunday, were largely peaceful, but police did use water cannons at one point to keep demonstrators at bay. The Israeli Prime Minister's Office has issued a serious travel warning for Israelis visiting Turkey. The warning calls Israelis who are about to travel into Turkey to postpone their trip and for Israelis in Turkey to remain indoors and avoid presence in the city centers. Lebanese Prime Minister Saad Hariri said the raid will inflame the region. "Lebanon strongly condemns this attack and calls on the international community, and specifically on the major countries which are supposed to be responsible about the peace process, to take action in order to stop this continuous violation of human rights, which is putting the international peace at risk," he said. Pakistan said it was concerned about the well-being and whereabouts of two journalists who were aboard the flotilla. "The Government of Pakistan strongly condemns the use of brazen force by Israel against a humanitarian Mission that was embarked on delivering humanitarian aid to the Palestinian people in Gaza," the country's foreign ministry said. "The killing of members of this humanitarian mission, which also included women, is brutal, inhuman and constitutes a flagrant violation of international law and norms." The convoy of boats left European ports in a consolidated protest organized by two pro-Palestinian groups to deliver tons of food and other aid to Gaza to break a blockade imposed by Israel in 2007. The groups are: Free Gaza Movement and the Turkish-based IHH, a humanitarian relief foundation affiliated with the Muslim Brotherhood religious group. The convoy approached Gaza in defiance of an Israeli blockade, and was shadowed by three warships. Free Gaza had reported Sunday that they had been contacted by the Israeli navy. Israel wanted the flotilla to dock at Ashdod port, where supplies would be unloaded and transferred to Gaza. About 15,000 tons of humanitarian aid flows into Gaza per week, said Israeli government spokesman Mark Regev. Saying that Israeli civilians were subjected to rockets and missiles fired from Gaza that had originated from places like Iran and Syria, the military prevents all ships from reaching the Gaza shore so that ammunition or missiles cannot be brought in, Regev said. Israel said Sunday that Western and Turkish authorities have accused IHH of having "working relations" with different terrorist organizations.